Τwo hundred meters from the harbor and the beach into the capital of the island , village of Fri, Maria Tsakiri (Chemical Engineer) has renovated and extended with an unusual manner the traditional family House which has the history of three generations and is also a Monument of local architecture , has been named after the great grand mother Angelica. The unique and thematic paintings, which decorates all the floors of the house are authentic works belonging to her mother, the stylist Lia Meleti, who welcomes you with warmth and in perfect English and French too. The charm of the authentic, combined with the comforts of today gives to this particular residence the spirit of Art ! The Artistic decoration is everywhere, the furniture’s, the wall paintings ! It is a perfect place to relax and get inspiration. The same refined and traditional style has created 4 bright apartments which combine authenticity and comfort, and offer unforgettable moments to the guests. This beautiful white and blue house has hidden in its interior an aura of serenity and rejuvenation. As soon as you enter, a magical interior courtyard full of flowers leads you into the reception area and the main sitting room, which leads you to the main house which is a Monument of tradition and local Architecture. 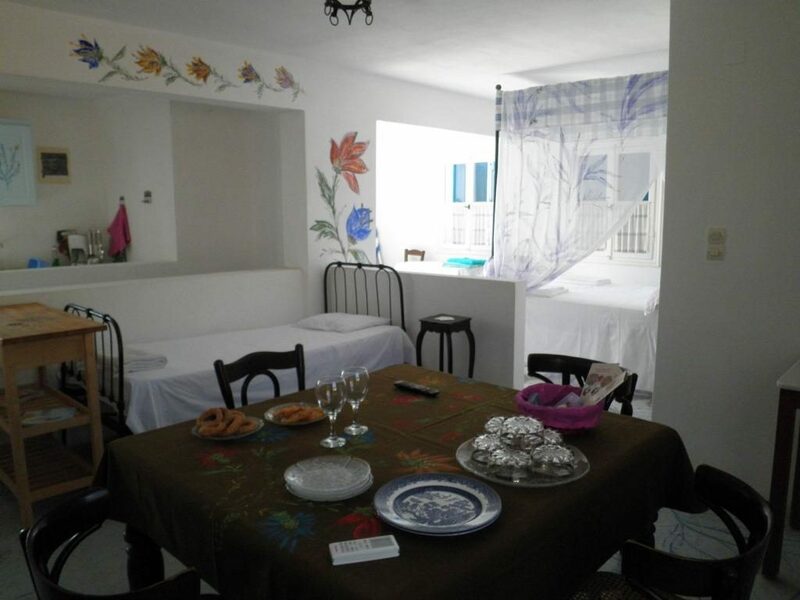 All apartments are fully equipped with kitchen – bathroom – air condition – TV -wi-fi internet and hotel amenities. The spacious, bright and comfortable apartments, refined artistic decoration, the elegance of traditional furniture’s and the original floor paintings, terrace and courtyard highlight the cozy atmosphere of this remarkable home. 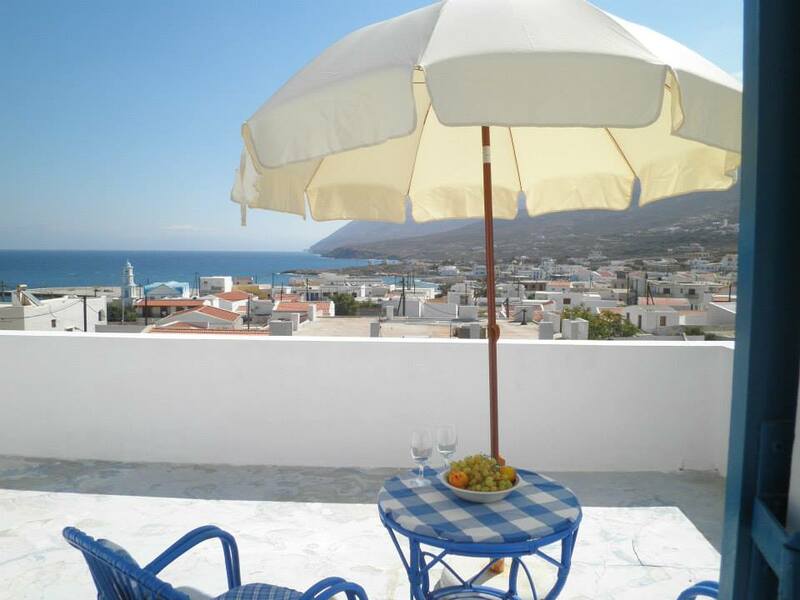 Enjoy the magnificent view to the Aegean Sea from the balconies of the house! 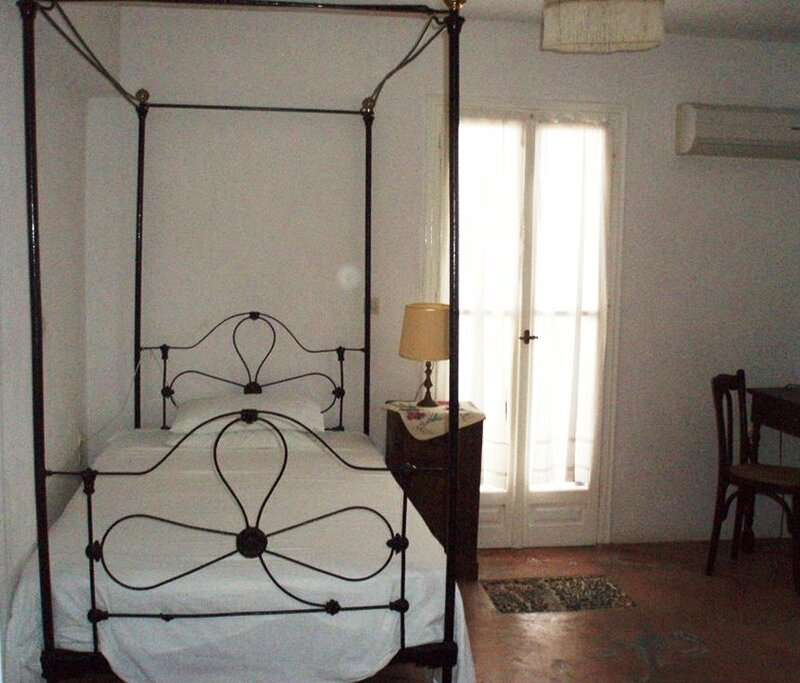 Apartment No 1 – Studio on the ground floor with courtyard and flowers. 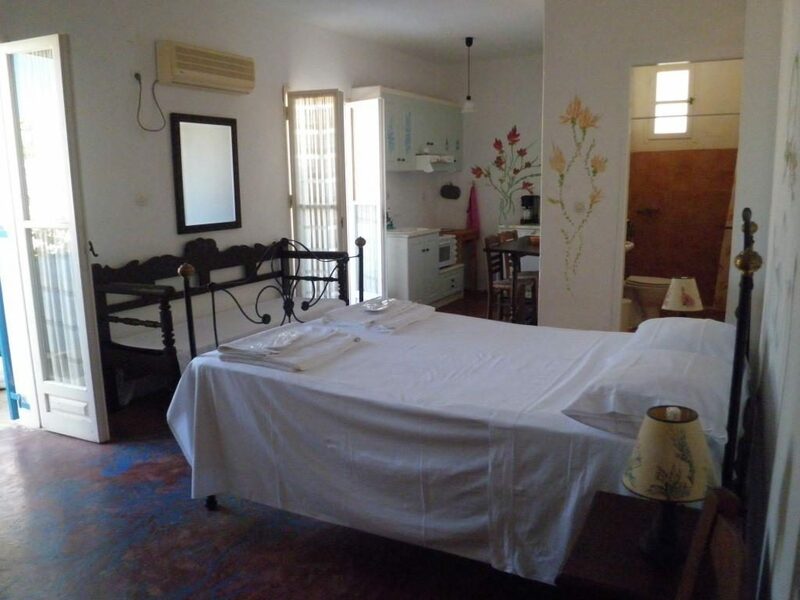 Without sea view, a very bright apartment with double bed and sofa, kitchen, bathroom, TV, air-condition, wi-fi internet and hotel amenities. It is appropriate for a couple with a child there is an extra spare bed. 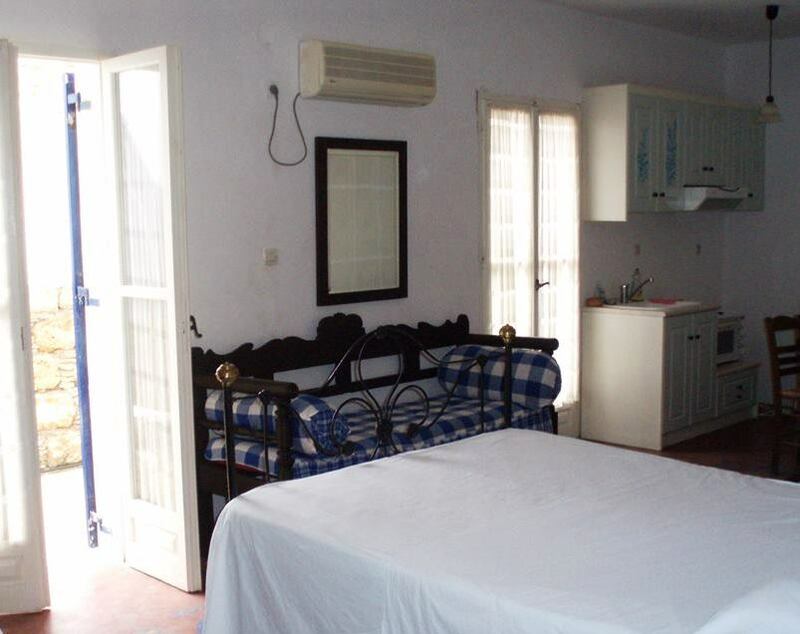 Apartment No2– Studio on the 1st floor with a balcony and sea view. 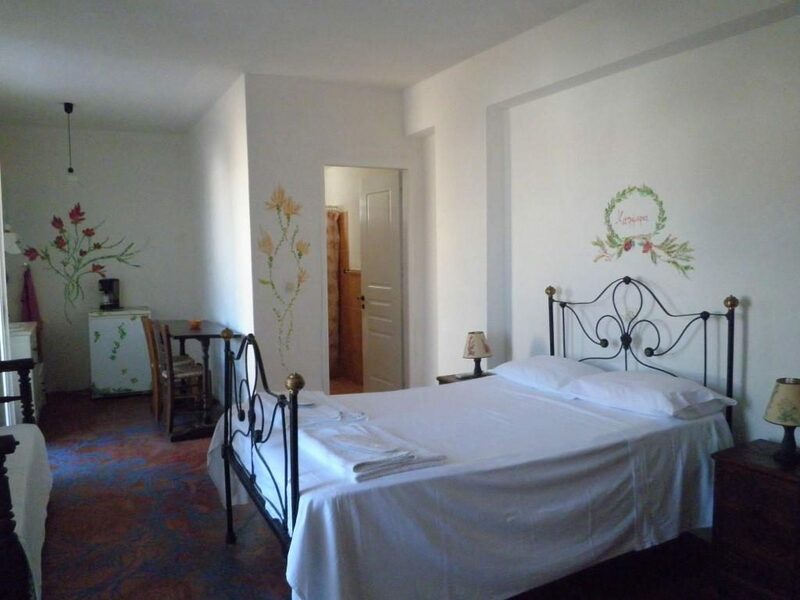 A very bright apartment with double bed, kitchen, bathroom, TV, air-condition ,wi-fi internet and hotel amenities. It is appropriate for single persons and couples. 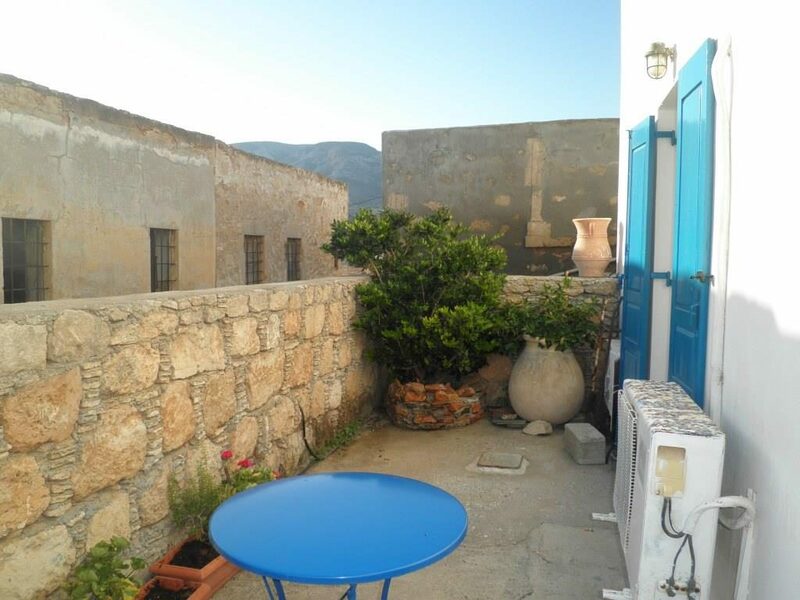 Apartment No3 – Two room apartment ( 1-3 persons ) –Apartment on the 1st floor –back side with a courtyard without sea view. 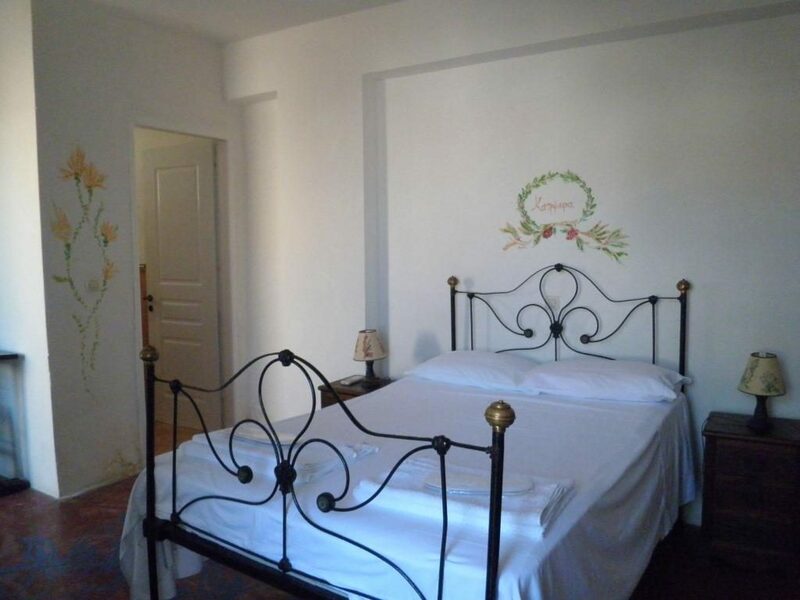 The apartment is fully equipped with double bed and sofa, kitchen, bathroom, TV, air- condition, wi-fi internet and hotel amenities. It is also appropriate for couples with children. 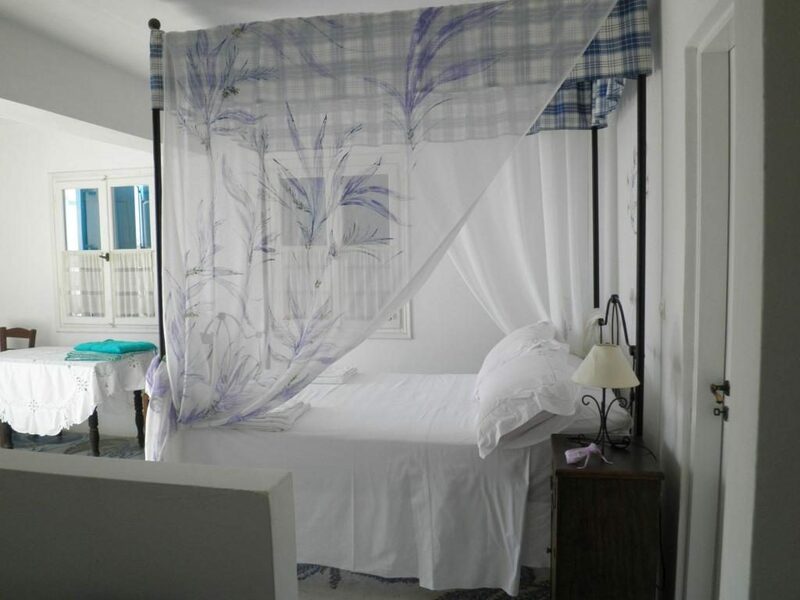 Large and bright apartment with big veranda and wonderful sea view, fully equipped with kitchen, bathroom, air-condition, TV, wi-fi internet and hotel amenities. 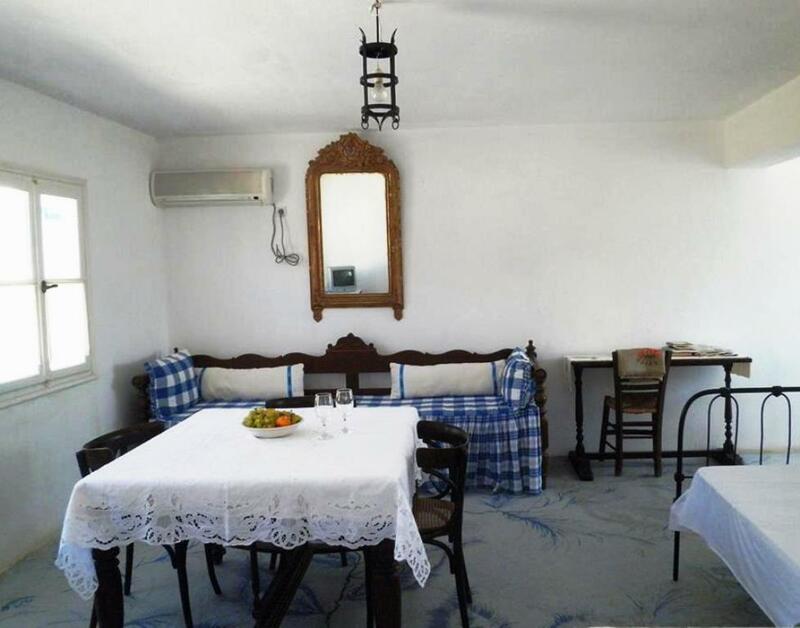 The large, bright and comfortable rooms, the tasteful and special decoration of each, the stylish traditional furniture’s as well as the magnificence floor & wall decoration, the verandas and the courtyard underline the warm atmosphere of this unique residence. 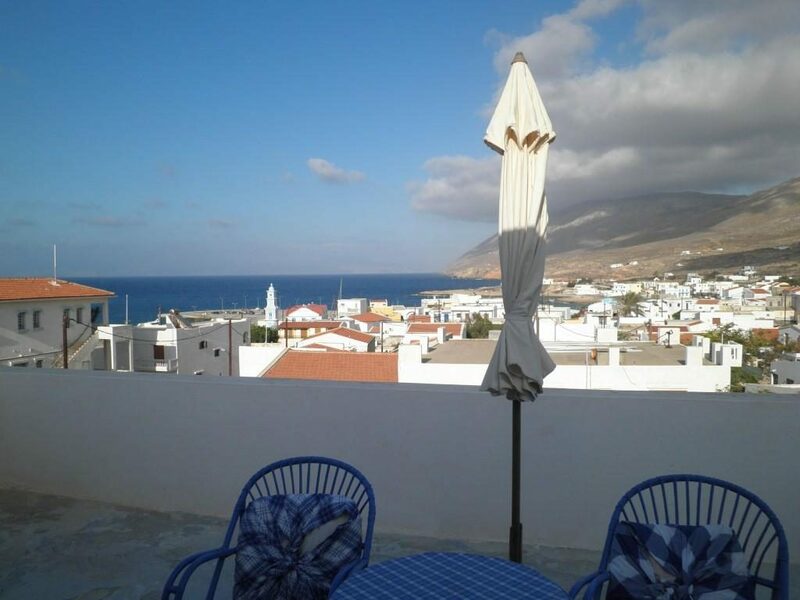 The view to the Aegean sea from the balconies of the house is extremely nice. Pets are allowed after request.